One of the most comprehensive sites online about reading pet food labels is the FDA’s site on pet food labels. We recommend that anyone with even a passing interest in dog food labels check out this page. The Drs. Foster & Smith site also has a very good page on reading dog food labels. The FDA requires pet food companies to include several items on labels. In addition, many states also follow the model guidelines suggested by AAFCO about what to include on pet food labels. You should expect to find the following information on pet food labels. We usually think of the name of a product as being fairly straightforward but product names are regulated when it comes to pet foods. AAFCO has four rules that govern the named ingredients in the food and how they are stated in the name. The “95 percent” rule refers to foods that have few ingredients. These foods might be called “Beef for Dogs” or “Tuna Cat Food,” for example. At least 95 percent of the food must be the ingredient in the product name – such as 95 percent beef in “Beef for Dogs.” This does not include water for processing or what are known as “condiments” (vitamins, minerals) in the pet food industry. With the moisture included, the named ingredient has to still make up at least 70 percent of the product. The named ingredient should be the first item listed in the ingredient list since ingredients have to be listed in order of weight before cooking. If the name of the product includes two ingredients, such as chicken and liver, for example, then those two ingredients combined must make up at least 95 percent of the total weight of the food. The first item listed in the ingredient list must be the ingredient of higher weight before cooking in the food. If there is more than one ingredient included in the “dinner” or “platter,” etc., name, then the combination of ingredients listed in the name have to make up at least 25 percent of the food. They also have to be listed in the order they are listed in the ingredient list (in terms of weight before cooking). Each ingredient listed in the name of a food has to make up at least 3 percent of the total of the food. So, if a food is called “Chicken n’ Liver Dinner Dog Food,” it has to have 25 percent chicken and liver combined. And at least 3 percent of the food must be liver. There is also a “3 percent” or “with” rule that applies to a product’s name. This rule was originally meant to apply to highlighted ingredients on the display panels but these terms are commonly used as part of the names of pet food now. Seeing the phrase “with x ingredient” on a dog food label should alert you that the food contains at least 3 percent of that ingredient – but probably not much more. To illustrate how wording matters with pet food, “Dog Food with Beef” means that the food can contain 3 percent beef. “Beef Dog Food” means that the food has to contain at least 95 percent beef. It’s important to read labels carefully! Finally, there is the “flavor” rule. This rule does not require a food to have a specific amount of a flavor or ingredient but the product has to have a sufficient amount so that it can be detected. These claims can be substantiated with different testing methods. The word “flavor” has to appear on the label in the same size, style, color, and look like the other product wording so the consumer is not misled about the product. The flavor can be be beef (or whatever it is claimed to be), but it is often some other substance that only gives the desired flavor such as beef meal or beef by-products. Digests are also used. Digests can be heat-treated, or treated with enzymes or acids to form concentrated natural flavors. It only takes a small amount of this kind of digest to provide the flavor for a dog food. Sometimes companies use stocks or broths. A milk flavor can be achieved by adding whey. Many companies say they use no artificial flavors but there can be ways around using artificial flavors. Pet food labels list the net quantity of the food. This tells you how much of the product is in the contain, whether it is a can or bag of food. The FDA has lots of regulations about this statement such as its format, size, and placement but it’s primary purpose is to help you compare the cost of different products. They make it easier for you to compare a 14-ounce can of food to a 16-ounce can, for example. Kibble can vary in density. A large bag of kibble may be lighter in weight if the pieces are “puffed up” compared to a smaller bag that has very dense pieces. Knowing the net quantity of the food can help you make a cost-per-ounce or cost-per-pound comparison. Dog food companies are required to list the manufacturer or the food or the distributor. This is the company responsible for the quality and safety of the product and their location. Some labels will say the food is “manufactured for” or “distributed by” which lets you know that the food was made by a third party or co-packer. They are responsible for the food should there be a recall or should you have any problems with the food, at least until you can contact the company owner. Some packaging includes an address but not all. Legally the company is required to be listed in a city directory or phone directory so they can be reached. Many companies voluntarily include a toll-free number on the pet food label so customers can make inquiries. If you have a question or complaint about the food, you should not hesitate to use any of this information to contact the company. Many owners are primarily interested in a dog food’s ingredient list. This is often the first thing they look at on the label. As we’ve already mentioned, ingredients are required to be listed by weigh before cooking. It’s important to consider that ingredients include their water moisture as they are listed. For example, one food may list chicken as a first ingredient and another food may list chicken meal first. Many people might think that it’s best to have chicken as the first ingredient. However, it has to be kept in mind that chicken (and other whole meats) are about 75 percent moisture. Chicken meal has already had the water and fat removed so it is only about 10 percent moisture. What remains in the chicken meal is mostly protein and minerals. When you remove the moisture from both ingredients, your dog will get more animal protein from the chicken meal. This is just a look at two ingredients. You would have to evaluate the ingredient lists for both foods to get a true picture of which food might be better for your dog. Ingredients are required to be listed by their “common or usual” name. This helps people identify them. You can find their definitions in the AAFCO Official Publication or online. AAFCO defines chicken meal as “the dry rendered product from a combination of clean chicken flesh and skin with or without accompanying bone, derived from whole carcasses of chicken, exclusive of feathers, heads, feet and entrails.” So, whole chicken probably sounds better. As you move down the ingredient list you usually encounter ingredients that have chemical names, vitamins, minerals, and other nutrients. Most of these ingredients will be “Generally Recognized As Safe” (GRAS) or food additives that have been approved. “GRAS” is an FDA designation that a substance added to a food (which can include human foods, too) is considered safe by experts. The FDA exempts such ingredients from their usual food additive requirements. In some cases the FDA can reverse decisions about GRAS ingredients. If there is scientific information that shows a health risk to animals from an ingredient or additive, the FDA’s Center for Veterinary Medicine (CVM) can prohibit the substance. For example, propylene glycol has come under scrutiny. It has been used as a humectant in soft-moist pet foods. It retains moisture and gives foods a chewy texture. Propylene glycol has been recognized as GRAS in human and animal foods for years – before its use in soft-moist pet foods. However, it was known that propylene glycol caused Heinz Body formation in the red blood cells of cats, though it could not be proven to cause other clinical signs, including anemia. There was, however, enough evidence of harm to the red blood cells of cats that ate food containing propylene glycol to convince the CVM to prohibit the use of this ingredient in cat foods. Ethoxyquin has been another controversial pet food ingredient. Ethoxyquin is not on the GRAS list, but is included as an EPA approved food additive. It has been an approved food additive for decades and is used as an antioxidant chemical preservative. It prevents the destruction of some vitamins and other compounds in animal foods and it stops peroxide from forming in canned pet foods. However, the CVM started getting reports in the 1990s from dog owners about bad effects that might be traceable to ethoxyquin: allergic reactions, skin problems, major organ failure, behavior problems, and cancer. At that time there was not enough evidence to support the claims. Further studies by the maker of ethoxyquin showed a dose-dependent accumulation of a hemoglobin-related pigment in the liver, and increases in the levels of liver-related enzymes in the blood. As a result, the CVM has requested the pet food industry to voluntarily lower the maximum level of exthoxyquin in dog foods from 150 ppm (0.015 percent) to 75 ppm. Most pet foods that used ethoxyquin never exceeded the lower amount even before this change. Many dog owners today seek out dog foods that do not use ethoxyquin as a preservative. One of the tricky things about identifying dog foods with ethoxyquin is that it can be added before pet food ingredients reach the dog food manufacturer. It is often used to preserve fish meal. If it is added to fish meal before the fish meal is delivered to the dog food manufacturer, the dog food company is not under any obligation to list ethoxyquin as an ingredient on the label. Companies only have to list ingredients that they add to foods themselves. The best way to find out if a company uses ethoxyquin or ingredients containing ethoxyquin is to check their web site for an answer to this question or ask them directly. There are good alternatives to using ethoxyquin, even when preserving fish meal, and some dog food companies will advertise that they use them. Naturox by Kemin is one such alternative. You can see some information about ethoxyquin toxicity here. Next to a dog food’s ingredients, the guaranteed analysis provides some of the most important information on the label. Most states require companies to list the minimum percentages of crude protein and crude fat, as well as the maximum percentages of crude fiber and moisture. “Crude” refers to a method of testing the contents and measuring what remains. It does not reflect on the quality of the nutrients or ingredients. Some companies will also include the guaranteed analysis for other nutrients such as ash. Ash is the inorganic mineral content left over when the rest of the food has been burned away. Canned dog food typically has an ash content around 3 percent. Dog food kibble usually has an ash content around 7 percent. You can use these estimated figures if you are trying to figure out how many carbohydrates a dog food has. Keep in mind that these are just generic pet food industry figures. The ash content varies from recipe to recipe and company to company. Other nutrients that you might see guaranteed on the label include calcium and phosphorus (especially in puppy foods), sodium, linoleic acid, omega-3 and omega-6 fatty acids, and other vitamins and minerals. Many companies list a full range of vitamins, minerals, fats, amino acids, and other substances on their web sites. They may also list a more precise nutrient profile on their web site instead of a simple guaranteed analysis. The guarantees provided in the guaranteed analysis are made on an “as fed” or “as is” basis. This means the guaranteed analysis refers to the food as it is in the can or bag. As long as you are comparing the food to another similar food – for example, another canned dog food with a similar moisture content – you won’t have any problem making an accurate comparison. However, if you want to compare the nutrition in a can of dog food to feeding your dog kibble, you have to make some calculations. A can of dog food often has 75-78 percent moisture content while a bag of dog food usually has 10-12 percent moisture. All of the nutrient percentages will be drastically different when you compare the two foods unless you adjust for the moisture content. There are several ways to compare canned and dry foods. You can find a web site or app that will let you plug in the percentages and find the dry matter basis of the foods for you. This is the easiest way. Or you can guesstimate. Since canned foods are about 75 percent moisture, just multiply the nutrient percentages on the canned food label by 4 and it should give you a rough estimate of their dry matter basis. It is usually accurate enough to let you compare a canned food to a dry food if you are standing in a pet food store aisle without a calculator handy. For example, if you are looking at a can of dog food with a guaranteed analysis of 8.5 percent crude protein; 6 percent crude fat; 1.5 percent crude fiber; and 78 percent moisture, you can multiply by 4 to get 34 percent crude protein, 24 percent crude fat, and 6 percent crude fiber as a very rough estimate of the dry matter basis of the food. In actual fact, when we run the numbers, we get 38.6 percent protein; 27 percent fat; 6.8 percent fiber; and 13.6 percent carbohydrates in the dry matter basis for the food. So, the rough estimate usually works out close enough to make a quick comparison. You can also do the dry matter conversion with old fashioned mathematics. For example, if you are considering a canned dog food that has 82 percent moisture, you would subtract 82 percent from the whole (100 percent) to get 18 percent dry matter. This food has 9 percent crude protein. Nine percent crude protein divided by 18 percent dry matter means that 50 percent of the food is protein after the water is removed. Likewise, the food is 4 percent crude fat. Four percent crude protein divided by 18 means that the food is 22 percent fat by dry matter basis. It’s particularly important to check the moisture amounts in canned foods, even if you are comparing one canned food to another. AAFCO regulations allow a maximum moisture content of 78 percent unless a food is labeled as a “stew,” “in sauce,” “in gravy,” or some similar term. This extra moisture is supposed to allow the food to have the texture and other qualities important for the recipe. However, some of these foods can have as much as 87.5 percent moisture. While this may not sound like much more that 78 percent moisture, it means that the food contains much less dry matter. A product with a guaranteed analysis of 87.5 percent moisture only has 12.5 percent dry matter. That means that it has half as much dry matter as a product that contains 75 percent moisture and 25 percent dry matter. You don’t want to spend all your money buying food that is almost entirely moisture. We have already discussed the nutritional adequacy statement in detail in chapter three, so we will only add a few words here. Dog foods are typically sold as “complete,” “balanced” or “100 percent nutritious.” This is supposed to assure the customer that the food is nutritionally safe. Foods that meet these requirements according to AAFCO can place a nutritional adequacy statement on the label. There are several methods a company can use to satisfy the requirements (see chapter three). Critics of the nutritional adequacy statement will point out several problems with the system. Not only can food trials be insufficient to determine if a food is really nutritious, but nutrient profiles (often used by smaller companies today due to the costs of food trials) can be misleading. A food may look good on paper but be less than ideal when it is actually fed to real dogs. In addition, some people point out that we don’t know everything there is to know about dog health and nutrition. Canine nutritionists may not be able to say with certainty that a food is 100 percent nutritious since experts can disagree about what constitutes the best nutrition for dogs. Consider, for example, the disagreements about starches and grains in dog foods. We have minimum/maximum requirements from the NRC and AAFCO which are reflected in nutritional adequacy statements, but these requirements are subject to change from time to time. So, the nutritional adequacy statement on a dog food label is the best statement we have at the moment to guarantee that a food is nutritionally safe for your dog, but you should not think that it is perfect. If a food has earned approval by means of a food trial, the nutritional adequacy statement will state something like: “Animal feeding tests using AAFCO procedures substantiate that (name of product) provides complete and balanced nutrition.” Be aware that the company only needs to have the lead product in a family of foods pass this kind of food trial in order for all of the related products to be approved. For example, if Boondoggie Chicken & Rice dry dog food passes the food trial, Boondoggie can use the same nutritional adequacy statement on their beef & rice dry dog food formula, their lamb & rice dry dog food formula, and so on. This is not as odd as it may seem since dog food companies usually use the same ingredients in their product lines other than the first couple of proteins and carbs. Other ingredients such as the vitamins, minerals, and other additives will usually be a very similar formula in all of the foods in the product line. The nutritional adequacy statement will also declare for which life stage the product is intended. This can be for growth, maintenance, all life stages. All life stage products have to meet stricter nutritional standards since they also cover the growth and reproduction stage of the dog’s life. All life stage foods can also be fed to dogs that are working. A maintenance food is intended to meet the nutritional needs of an adult dog that is not reproducing. This dog will only be doing normal pet activities. If a product does not meet any of these nutritional requirements it has to state “this product is intended for intermittent or supplemental feeding only.” Some foods that are 95 percent protein fall into this category since they can be used as toppings but they do not meet all of a dog’s nutritional needs. Treats do not require a nutritional adequacy statement. Snacks, treats, and supplements should be clearly labeled as such so owners won’t be tempted to feed them as food. Feeding directions on the label are exactly what they sound like. They tell the buyer how much of the food they should feed their dog. They are typically based on the Resting Energy Rate guidelines. Anything your dog does besides resting will cause an increase in energy (RER) expenditure which means an increase in calories used to meet those energy needs. The table doesn’t tell you how much to feed your dog but it does show how energy requirements vary based on a dog’s activity. Other factors will also affect how much your dog needs to eat such as breed differences, the temperature, how warm his coat keeps him if he spends time outside, and so on. (The formula uses kilograms. You can use a site such as http://www.asknumbers.com/PoundsToKilogramsConversion.aspx if you are like those of us who are math-challenged.) So, for example, my dog weighs 42 pounds. I can find an estimate of how much food to feed her by using the table and the formula. Her body weight in kilograms is 42. That is about 19 kilograms. All of this is just an estimate of how much I should feed my dog based on the formula and the daily energy requirements for different energy expenditures, but this is how dog food companies arrive at the recommended feeding suggestions on their labels. They are usually based on small, medium, and large sized-dogs so they have a lot of leeway in their recommendations. You should take them with a grain of salt. You can make more accurate judgments for your dog if you know how many calories your dog needs per day and how many calories are in the food. Some packages will provide more feeding instructions than others. Small cans may not be able to give you much information while big bags can go on and on – and even give you diagrams about feeding your dog. You can usually check a company’s web site for more information about feeding directions. Calorie statements have not always been provided on dog food labels. You may find some dog foods today that do not have calories listed on their labels. If so, calorie information should be on the brand’s web site. It is usually listed with the feeding directions for some reason. It is important for consumers to know how many calories are in their dog’s food, especially since so many dogs today are overweight and obese. 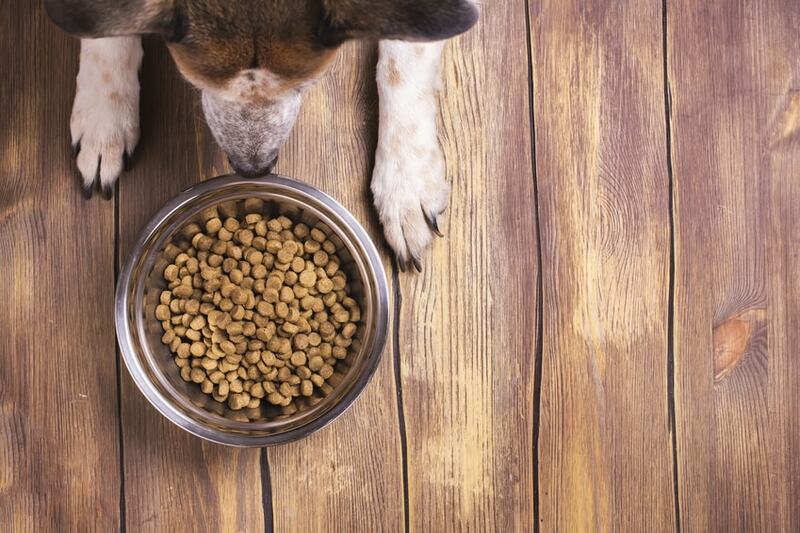 Dog foods can vary greatly in the amount of calories they contain. If you are used to feeding your dog an average food with average calories and you switch to a food that has more fat – which is very calorie-dense – your dog can quickly start to gain weight. You may not notice the weight gain until your dog is starting to look very porky. AAFCO requires the calorie statement to be stated as “kilocalories per kilogram.” Kilocalories are the same as the “Calories” consumers are used to seeing on food labels. A “kilogram” is a unit of metric measurement equal to 2.2 pounds. Dog food companies also have to express calories in terms of a familiar household unit such as “per cup” or “per can.” The calorie statement must be made on an “as fed” basis so consumers can make corrections for the moisture content of the food. You can make a rough comparison of the caloric values between a canned and dry food by multiplying the calories in a canned food by four. Do be particularly careful about comparing cans of dog food since they come in different sizes. One brand may tell you that a can of their food contains 50 kcals while another brand says a can of their food contains 150 kcals. If you check the size of the cans, one of them may be 3 ounces and the other may be 5 ounces. You would probably notice this difference if you were looking at the cans in a store but it’s not always easy to tell the information refers to different container sizes if you are comparing foods online. You’ll notice there are plenty of other claims and statements on dog food labels but many of them are not regulated. Terms like “premium,” “super premium,” and “ultra premium” used in advertising, along with “gourmet” or “holistic” have no regulations to back up their claims. They do not have to have ingredients that are of higher quality than other foods. They don’t have to have any higher nutritional standards than other dog foods that are also complete and balanced. These are simply marketing terms. Any company can use these terms. “Natural” does not mean the same thing as “organic.” Organic has a very specific meaning under FDA regulations. It refers to the conditions under which plants are grown and animals are raised. Certified organic foods have to be grown without pesticides, artificial fertilizers, irradiation, sewage sludge, or genetic modification. The animals have to be raised on organic feed, have access to the outdoors, and cannot be treated with antibiotics or hormones. There are several different USDA-certfication levels for organic foods: 100 percent organic, organic (95-99 percent organic), made with organic ingredients (70-94 percent organic), and less than 74 percent organic. There are several dog food brands that have organic foods. Most of them fall in the “made with organic” and “less than 74 percent organic” categories. It’s hard for dog food manufacturers to use all-organic ingredients, though some try. The regulations used for this labeling are the same as for human organic food. There are currently no regulations specifically for organic pet food but the USDA is said to be developing regulations which would regulate which kinds of synthetic additives, such as vitamins, minerals, and purified amino acids, could be used in organic pet foods. You should be aware that poultry in the U.S. is always hormone-free and it has been for over 50 years. This includes being free of growth hormones. The same is true of pork in the U.S. Advertising that gives consumers the impression that a dog food is using some kind of special hormone-free poultry/chicken (or pork), is intentionally misleading. Antibiotics use (or their lack) in raising poultry and other animals is a separate issue. New regulations are requiring farmers to cut back or eliminate the use of antibiotics in feed. Antibiotics have long been used to encourage better growth in farm animals and to ward off disease. There’s a lot of information on dog food labels if you know how to interpret it. You can find even more when you visit most dog food company web sites. Make sure that you are not taken in by marketing claims or false advertising. Know what you are reading and what it means.